Enjoy our travel Guide to Venice! Venice, the City of Canals, is one of the most beautiful and romantic holiday destinations in Europe. Just the name of the city, brings into mind its picturesque canals, fascinating gondolas and marvelous architecture. Located on the northeast coast of Italy, this amazing city is protected from the Adriatic Sea by a strip of land called the Lido and the region around is known as Veneto. Venezia(in Italian), is made up of different districts. Districts of the city i.e Cannaregio, Castello, Dorsoduro, San Polo, Santa Croce and Santa Marco, houses the main sights and attractions of the city. Every visit to the city, gives a magical and dreamlike feeling. However, Venice can be very confusing for first time visitors. To enjoy an inimitable charm, it is very necessary to go through a proper travel guide to Venice. This is an excellent 3-day travel guide to Venice, where we have come up with great ideas to make it one of your best holidays. 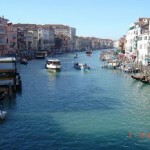 • Travel Guide to Venice: History: Venice is said to be dating back to 827. Under the rule of the Romans the city prospered as a trade center. In 1797, the city was sacked under the rule of Napoleone Bonaparte. It was during this period that Venice was handed over to Austria.Though Venice couldn’t recover much since then, most of the history and culture of the renaissance are still safely preserved. It was in 1866 that Venice was annexed to Italy. Travel guide to Venice tip: Book your tickets for the main historic sights in advance to avoid long queues. • Travel Guide to Venice: Best Time To Visit: Nobody likes a holiday on a bad weather. Venice is at its best during the spring season and during fall. 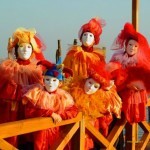 February brings Carnival time in Venice, making the city busy and colourful. Those visiting the city during this time should make sure to book hotel rooms in advance. Many tourists visit the city during the summer months but according to the travel guide to Venice it might not be very pleasant because of the stinking wet smell of the canals. Travel guide to Venice tip: Winter months can be very dull and chilly but great to enjoy a peaceful holiday. • Travel Guide to Venice: How To Reach Venice: Marco Polo Airport, located on the mainland near Mestre is the closest commercial airport. From Venice the Treviso Airport is just 25km. You can take a bus from both the airports to Venice. Train services to the city are available from many international destinations such as Paris, Munich, Budapest etc. From the train station, you can take a water bus or water taxi to reach your hotel. Travel guide to Venice tip: Those driving by car, can arrive only upto the city’s entrance i.e Piazzale Roma(also called Tronchetto). • Travel Guide to Venice: Finding Good Accomodation: Accomodation in Venice ranges from budget, business, tourist, luxury, bread and breakfast to fully equipped apartments. You can choose one that matches your taste. Almost all the hotels in Venice offer standard quality and great value. You will surely enjoy a very comfortable stay. According to the travel guide to Venice some of the best hotels in the city are Hotel Diana, Hotel Dona Palace, Continental Hotel Venice, Hotel Tintoretto, Hotel Residenza Cannaregio, Hotel Star Splendid Venice, Hotel Torino, Hotel Carlton Grand Canal etc. 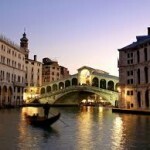 Travel guide to Venice tip: Avoid the hotels in cental Venice if you are on a budget trip. • Travel Guide to Venice: Getting Around Venice: Just walk around the city and you will be able to reach all the interesting places. Since, roads in Venice are free of cars, you won’t find any difficulty walking around. Besides, there are yellow placards all over the city indicating the directions to the main attractions and the white signs points out the name of the streets. Purchase a detailed map of the city if you still have the fear of getting lost. There are a number of vaporetti and water taxis available that will take you around the city. Travel guide to Venice tip: Purchase Venice card that can be reserved online or in tourist offices, to enjoy dicounts. • Travel Guide to Venice: Food and Drinks: The travel guide to Venice would like to point out that there are numerous restaurants and eateries in the city, many of them offering Venetian cuisine. To enjoy your dinner enjoying views of the Grand Canal, choose one of the restaurants near the Rialto Bridge. Beware food can be a bit expensive in Venice. If you want to put up in an apartment, get fresh fruits, vegetables and cheese from the Rialto food market. You will surely save money that way. Another way of enjoying food at cheaper prices is to head towards the restaurants in the Dorsoduro area, the usual place visited by locals and students. Along with pastas and pizza, specialities such as Polenta Nella Seppia are must try. Travel guide to Venice tip: Try out places such as Pizza al volo, The Brek, La Bitta, Al Giardinetto, Restaurant Antiche Carampane and Do Leoni. In Venice, you will also find many bars. Who would not love to visit Harry’s Bar and try Bellini, a mixture of white peach juice and Prosecco? You can also try Spritz or Grappa in the bars and pubs of Venice. • Venice is an attraction in itself. Follow travel guide to Venice and choose a water transport from the airport to reach your hotel, to enjoy great views of the city. This character of Venice, makes it unique from all other cities. Make sure to have your camera ready the moment you reach the Venice Airport. • After checking into your hotel and refreshing yourself with a nice cup of coffee, prepare yourself to explore the city for the rest of the day. It is advisable by the travel guide to Venice, to purchase a combined pass for museums, churches and transportation, available in the tourist information offices in Venice, before heading out towards the attractions. • Day 1, should be preserved for the San Mark’s Sqaure(Piazza San Marco) as it is an area surrounded by a host of interesting attractions such as the St. Mark’s Bascilica. St. Mark’s Basilica opens around 9.45am and allows free entry. If you wish to visit the museum and the altar treasury upstairs, it might cost you € 2-€ 3. To avoid waiting for entry into the Bascilica, travel guide to Venice would like to advice you to reserve your visit, which costs just € 1. Built to house the reliquary of St. Mark and the saint’s tomb, this beautiful church, welcomes millions of visitors every year. Make sure that you are appropriately dressed to be allowed entry into the Basilica. • While roaming around San Mark’s Square, you will come across the Clock Tower(Torre dell’Orologio) and Campanile, one of the tallest structure in Venice. To enjoy great views of the attractions surrounding the Sqaure, you can climb to the top of Campanile. • Without wasting much time, head towards the Doge’s Palace(Palazzo Ducale). This beautiful water front attraction in Venice, was the former house of the Government of the ancient Venetian Republic. Here you will get a lot of information about the origin and history of the city and find numerous treasures of art, which includes works of Venetian art masters. Take some time to check out the treasures of the Musello dell’Opera located on the ground floor of the Duke’s Palace. Later on you can take a walk along the Bridge of Sighs, that connects the Doges Palace to its former dungeon. The view of the Grand Canal from here is amazing. • Come afternoon, the best thing to do according to travel guide to Venice is to leave the crowd behind and reach for the picturesque Rialto Bridge. Walk across the bridge to reach the Rialto Market. You can enjoy some relaxing moments here. There are many eateries nearby this area offering genuine food and local wine. • After relaxing for about an hour, you can return to the St Mark’s Square to visit the Correr Museum. It is one of the greatest example of monumental architecture of the Napoleonic period. The art collection in this museums is very impressive specially the collection of the Renaissance period and masterpieces by Antonello da Messina, Carpaccio, Bellin and Lotto. • When talking about the museums in Venice, Academy Galley also known as Galleria dell’Accademia, is counted among the best. Located on the Grand Canal opposite Piazza San Marco, this museum has a remarkable collection of art that dates from the 13th to 18th century. Keep in mind that this museum remains closed on Mondays. • Located very close to Accademia is the Peggy Guggenheim Museum, a visit to which is hard to resist. You will be fascinated by the collection of this museum i.e European and American art dating from 20th century and personal collection fo Guggenheim. Note that the museum remains closed on tuesdays. • You have been roaming all day long. So, travel guide to Venice would advice you to head directly towards your hotel room after enjoying a light dinner. • Start your day with a hearty breakfast. Reach Basilica dei Frari around 9.30am, an ideal place to marvel at architectural marvels of Venice. Located in San Polo, the interiors of this Basilica shines with sevelral paintings by Titian, Bellini and Donatello. • Next on the list should be Basilica of Santa Maria della Salute. It one of the attractions that stands out on the Venetian skyline that too because of its white coloured architectural forms. Located near to Dogana, it houses the well known sculpture of Virgin with Child. • If you are an admirer of Gothic architecture, Ca’ d’ Oro is a must visit attaction. Others can visit Fondaco dei Turchi, a palace on the Grand Canal, which has been converted to a Natural Science Museum. You will love the interiors of this palace decorated with beautiful marble fountains, columns and staircases. It was previously the first seat of the Correr Museum, now located on the St. Mark’s Square. • The Glass Museum is one of the favourites of travel guide to Venice. The museum remains open on all days except wednessdays. Here you will get a chance to see glass sculpture, which is entertaining and educational. Take your time to go through the shops in this Murano Glass Factory that sells some of the most beautiful pieces of glass art. • To take a break from sightseeing, step into one of the cozy looking restaurants and order some of the Venetian specialities. Trip to Venice won’t be complete without tasting some delightful pasta or smocked ricotta cheese. Sea-food is also a must try. For dessert you can taste Galani or Frittelle. For those not in mood for a heavy lunch, Caffè del Doge is the ideal place. This cafe offers special coffee and pastries that are not to be overlooked. • Venice is known to house masterpieces of art all around its corners. One such place is Ca’ Pesaro, a beautiful palace housing the gallery of modern italian art and the Marco Pollo Museum. It is definitly worth a visit during your vacation. • Evening can be spent in Teatro San Gallo, located in the right corner of St. Mark’s Square. Here you will be able to enjoy history of Venice shown by live performers. 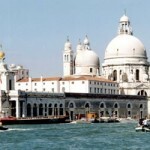 • Another option is to take a boat ride in the Grand Canal before its too late. It is an ideal way of refreshing yourself. Travel guide to Venice would advice not to take a ride on gondolas as it can be very expensive. You can try riding in a vaporetti or a traghetti. • Your day can come to end in Harry’s Bar. Fresh peach juice and sparkling wine Bellinis are very famous here. In Osteria al Bacco, you will be able to enjoy a three-course fixed-price menus that are moderately priced and you will get good value for money. Don’t forget to try some Cicchetti. Those very tired can take suggestions of travel guide to Bruges and head directly to their hotel. • Travel guide to Venice would like to take you on a trip to the island of San Giorgio, to find the Church San Giorgio Maggiore. This church preserves important works by artists such as Jacopo Bassano, Sebastiano Ricci, Vittore Carpaccio etc. It also houses Leonardo da Vinci’s homonym work ‘The Last Supper’ by Tintoretto. • For a very unique experience in the city, visit the Lido island. This island is known as the home of the annual Venice Film Festival. Besides, the sandy strip of this area is very inviting to enjoy leisure activities. On this island you will also get a chance to visit one of the oldest Jewish cemeteries in Europe. • Venice’s Arsenal and the Naval History Museum are two places that travel guide to Venice points out to be interesting for day 3. You will get lot of information about the city’s rich maritime history. • The beautiful Italian city boasts of various parks and gardens that can offer much refreshment. Giardino Giusti, is one such beautiful Renaissance gardens offering greenary all around. You will be surely overwhelmed after spending some time in this garden. You can also visit the Royal Gardens located next to Piazza San Marco. • Later in the evening, you can enjoy some shopping, as Venice is without doubt one of the main centres for shopping in Italy. As mentioned above Rialto Market is definitly worth visiting many times. To the west of San Marco, there are many interesting and unusual shops. You might like to buy some fine velvets and silks. According to travel guide to Venice shopping can be an expensive affair. Over all spending your three days in the way mentioned in this travel guide to Venice, will surely help you take home sweet and pleasant memories. More hotels in Venice? Visit BookYourHotel.org for the best offers. This entry was posted by admin and is filed under Travel Guide. Follow any responses to this post through RSS 2.0. You can leave a response or trackback from your own site.